It feels like a perpetual holiday here at the Swirl Smell Slurp headquarters. On Sunday He disappeared for an hour and came back with a package He wrapped himself in a brown paper bag full of goodies for Valentine’s Day, including a chilled bottle of Lassalle Champagne, a favorite producer of mine. 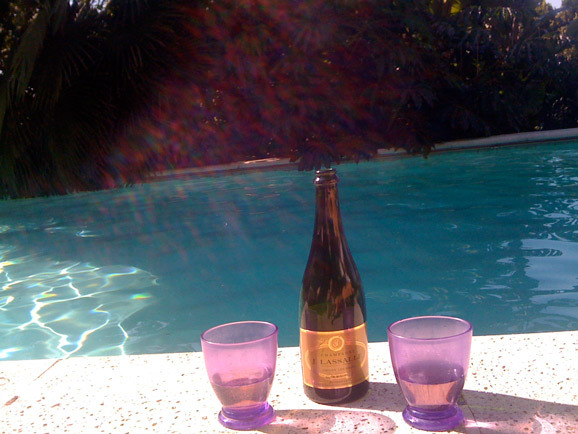 The weather was fantastic so We decided to pop open the bottle and enjoy it poolside. The wine was pure pleasure and delicious, even out of pool-friendly plastic cups; rich, well balance, and had a wonderful toasty, yeasty finish. A delight. Yesterday We celebrated another sunny day and my upcoming move by twisting the cap off a refreshing Sauvignon Blanc by Pic*nique, purchased from Locali, an organic driven store near my new house (their tagline is “conscious convenience”). The shop has lovely, small selection of organic wines. The SB was bright and fruity with lots of citrus and a lush, full finish. A terrific bargain white for just $10.50. As for this sunny day: it is His birthday. For my own last October He presented me with a beautiful bottle of wine and declared We would have a new gift giving tradition: popping open the previous birthday’s gift to celebrate the new one. Lucky Us: tonight We will be slurping Williams Selyem Pinot Noir. And now…what bottle will I present to Him today to be opened on my birthday? Red Bordeaux is on the brain and its flavors have been teasing my palate in anticipation of this weekend’s SSS Sunday Salon (have you RSVP’ed yet?). I’ll sneak out later later and pick out a bottle. And wrap it myself in a brown paper bag. Our first Sunday Salon was a success. 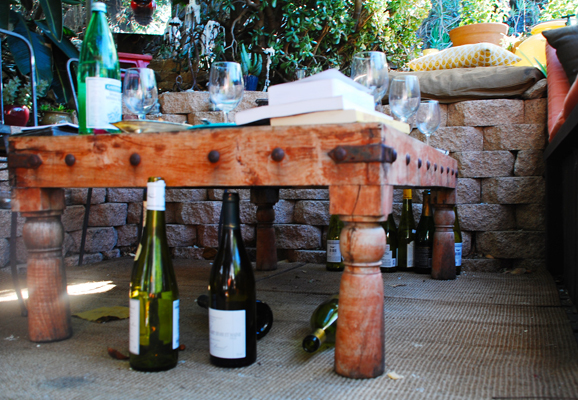 Fifteen of us gathered in Her living room (aka the patio) for an evening of smelling, swirling, slurping, and lively conversation (mostly about wine). We’ll post a detailed recap of this delightful evening on Sunday. In the meantime, We’ve got some dishes to do.